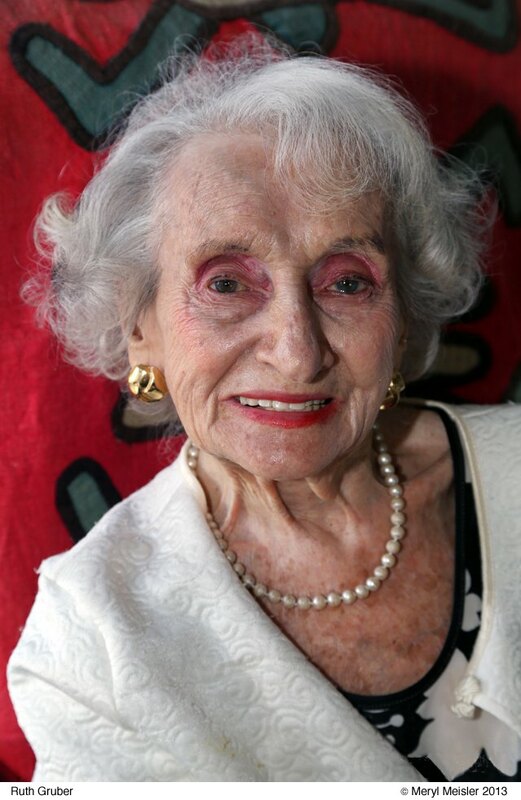 At 101 years old, Ruth Gruber greeted us at The Living Gallery with perfectly placed hair, an outfit that looked like it came straight from Chanel's very own runway and electric pink eye shadow. At 25 I still can't manage any of these things, so I'm already feeling her hustle. 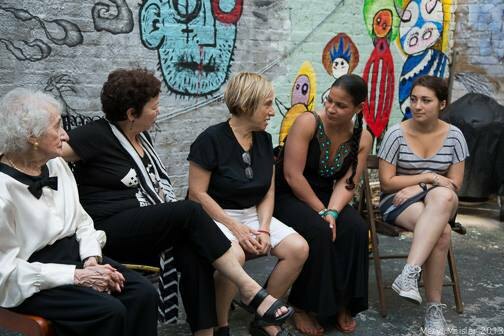 This Bushwick native has made the most of a century. From left to right. 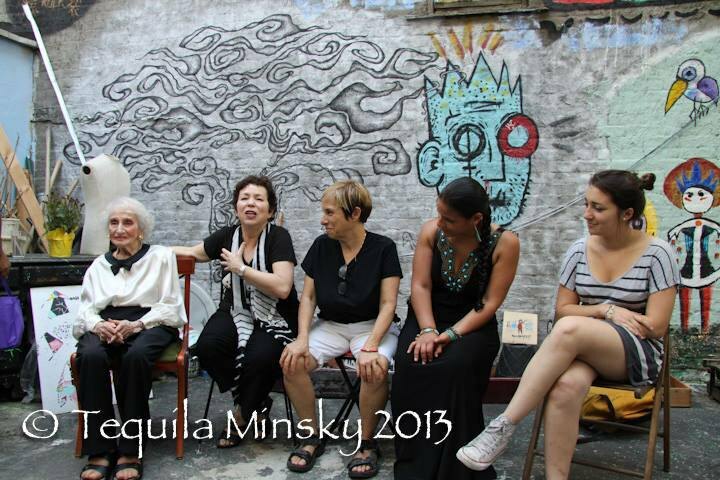 Ruth Gruber, Photographer Meryl Meisler, Ruth's daughter Celia Michaels-Evans, writer Vanessa Mártir and Ruth's granddaughter, Lucy Micheals- Evans at The Living Gallery. Photo by Tequila Minsky. And while just from this shortlist we could go on and on about how crazy-cool Gruber is, the story of how her work in Alaska under Harold Ickes ultimately made her a General is a particularly grand tale. We sat down with her daughter, Celia Michaels-Evans who told us the story alongside Ruth. Ruth Gruber via Ruth Gruber Facebook Page. 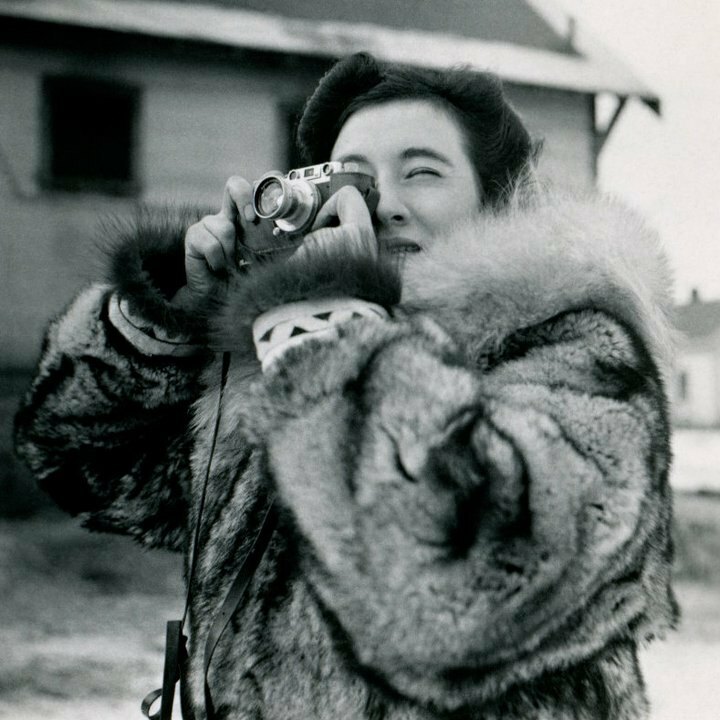 So she got to the Soviet Arctic - were you the first journalist mom? Probably the first western journalist. She saw women under the Soviet system. There was a woman Mayor. Women were really running this town in Siberia, and my Mother wrote a book about it which impressed Harold Ickes, who was the Secretary of the Interior under Franklin Roosevelt. So my Mother went to interview him for the Herald Tribune, and at the end of the interview she had a job. He decided to send her up to Alaska, just to live there, to see what it was like, to see if they could open it up and have people move up there. I think a lot of people thought he was making a mistake and that he shouldn't open up Alaska. It had been referred to as 'Seward's Folly' when a previous Secretary of State bought it. So Harold Ickes wanted to make something of it, sent my Mother up there, and I think you had a lot of fun, flying around and meeting all the people stationed in the army. Ruth Gruber and the crew. Photo by Rena Cohen. So the Senate was trying to deny her pay because at the end of my mother's book called 'I went to the Soviet Arctic,' she says, 'I want to come back to Russia and go into the sea and say 'Drasvaja.' They said, 'Look she's a communist! Look she wants to go back there!' So Senator Bullwinkle stands up in front of congress and says, 'This woman is just saying she wants to take a bath!' So they decided to pay her which was nice, and she went on to Alaska. 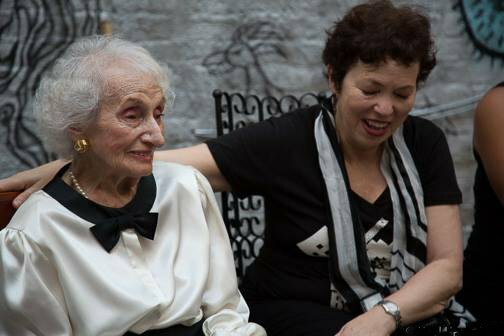 Ruth Gruber with Meryl Meisler at The Living Gallery. Photo by Rena Cohen. She was still working for Ickes when she read that America was prepared to save 1,000 refugees from Hitler, so she went to Ickes and says, 'Look Boss, you gotta send me!' And I think he thought about it and immediately said okay. My Grandmother who lived very close to here, on Harman Street, was very worried about my Mother going to Europe. My Mother said, 'Come down and meet my boss,' and she brings my Grandmother to meet Harold Ickes. My Grandmother says, 'You're sending my daughter to Europe! She can get killed!' So Harold Ickes looks at my Grandmother and says 'Don't worry little mother, We're gonna make her a General.' That way if she was captured they have to treat her right by the Geneva convention. So this is General Mom. 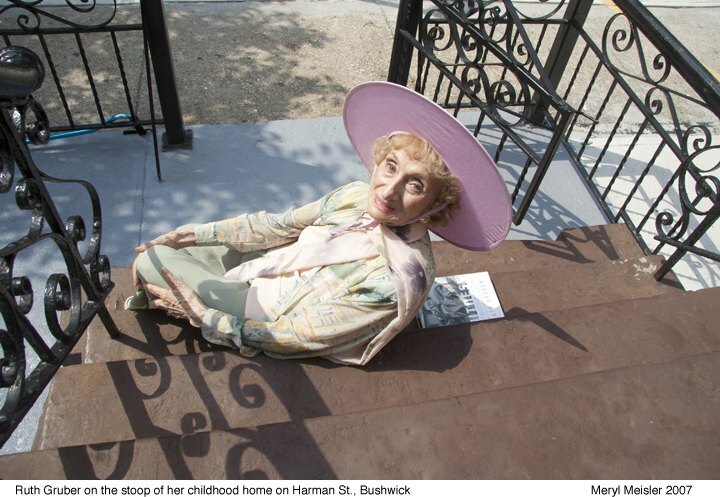 So while Bushwick has been called home by some pretty incredible residents, such as Mae West and Eddie Murphy, it also birthed a game-changing gal over a hundred years ago. Bushwick, in your name you have a General, the youngest Ph.D to receive a doctorate, a pioneering photographer and a writer of great influence. You have Ruth Gruber!! (1) Pulled from Ruth Gruber's Wikipedia page.